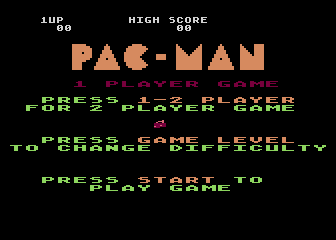 A game that needs no introduction, Pac-Man is the single most popular video game in history. Originally called Puckman, the name was changed at the last minute due to the fact that the middle section of the 'P' could be scratched away making the name into a swear word (use your imagination). The character Pac-Man was born from a pan of pizza with one slice missing. When Toru Iwatani (programmer of the original arcade game) gazed down at the pizza, it dawned on him... a circle with a wedge missing for a mouth... and so, Pac-Man was born. 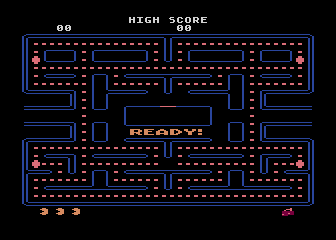 Although the 2600 version of Pac-Man was a colossal disappointment, the 5200 version is actually pretty close to the arcade game. The maze may be stretched horizontally (as it is in all home versions), but the gameplay remains true to the original. The 5200 version even included the intermissions between rounds which was even missing from the 400/800 version (probably because of space limitations). 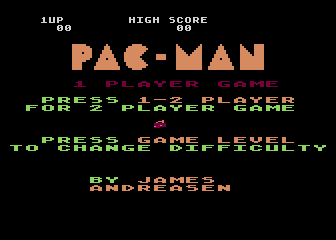 The 5200 version also has a hidden easter egg that can be accessed by typing 0,7,2,2,6,2,6 on the title screen (which spells out PacMan). The 400/800 version did not have this easter egg since it was programmed by a different person. Yes once again the 5200 joysticks ruins what is otherwise a great game. The non-centering sticks make the precise movements required in the game nearly impossible. Overshooting tunnel entrances and ramming into ghost monsters become an all too common occurrence. The best way to overcome this problem is with a third-party joystick or a Masterplay interface. Once the control issues have been taken care of, it becomes obvious why the 5200 was called the home arcade machine. On an interesting side note Atari decided to replace the Galaxian symbol from the arcade game (the fruit for rounds 9 and 10) with the Atari Fuji symbol. This is most likely because the Galaxian symbol was still under copyright form Namco (and a little extra Atari marketing never hurts). 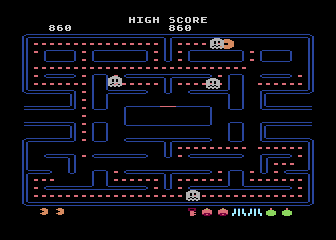 Pac-Man eventually replaced Super Breakout as the pack-in game for the 5200 during the last year of its life. This was a much better choice since Pac-Man was a single player game and a huge arcade success, whether it helped sell more 5200's is anyone's guess.